Our beloved mother, grandmother and great grandmother, lovingly referred to by all as "GG", went home to be with the love of her life who previously passed, Hartwell Eugene Martin, on June 22, 2014, in Frisco, Texas. She was born April 1st, 1933, to Grace and Hugh Stockton in Tuscola, Texas, graduated from Jim Ned High School and went on to McMurry College in Abilene, where she obtained her Associates Degree along with meeting her husband. They married May 26th, 1953. Midland became their permanent home in 1962, where they both began their careers as coaches. 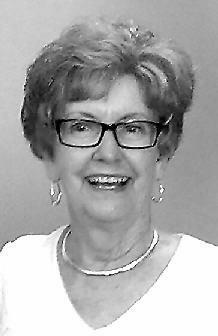 Jo Ann began her career at Coleman High School while achieving her Bachelors Degree. She was later offered the girls volleyball coaching position at Midland High School, beginning in the fall of 1969. Her career continued as coach and teacher of typing and note hand. She retired from coaching in 1981 and teaching in 1986. She enjoyed her retirement, being with her family at every opportunity, shopping, and gardening. Frisco has been her home from April of 2013, until her passing. She is survived by her daughter, Kim Martin Corbitt and husband James and their daughters, Madison and Mackenzie; daughter, Robbie Martin O'Donnell; and son, Casey, wife Brittany and sons, Casey, Zach, and Ethan; and son Chance O'Donnell, wife Rachel, their sons Kelton, Dillon, and Ayden; daughter, Laura Martin Phelps, husband Chuck, sons Coleman, Cooper, and Cannon. She is also survived by her brother, Jerry Don Stockton, wife LeNora; and Sister Linda McMillan. Pallbearers serving the Martin family will be Casey and Chance O'Donnell; Chuck and Coleman Phelps; James Corbitt and Brandon Hawkins. Honorary Pallbearers will be Cooper and Cannon Phelps. Friends will be received at the Ellis Funeral Home; 801 Andrews Hwy. Midland, Texas 79701 form 6:00 p.m. to 8:00 p.m. on Wednesday, June 25, 2014. A "Celebration of Life" will be conducted at St. Paul's United Methodist Church, 4501 Thomason Dr. Midland, Texas at 12:00 p.m. on Thursday, June 26, 2014, with Reverend Randy D. Thomas officiating. Burial will follow at Resthaven Memorial Park in Midland, Texas. Online condolences may be offered at www.ellisfunerals.com.